Sixty years ago, an American classic was born. 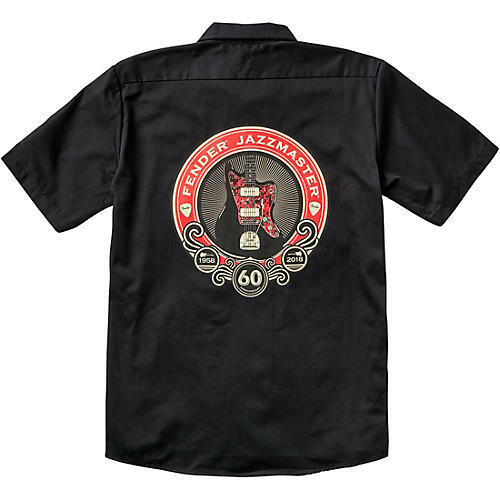 Commemorate the legacy of the surf-rocking Jazzmaster in this conversation-starting workshirt, featuring a 60th Anniversary Jazzmaster, pickup and Fender spaghetti logo screen-printed designs.Choose your size from the dropdown menu. Sixty years ago, an American classic was born. Commemorate the legacy of the surf-rocking Jazzmaster in this conversation-starting workshirt, featuring a 60th Anniversary Jazzmaster, pickup and Fender spaghetti logo screen-printed designs. Choose your size from the dropdown menu.